Analog Sound and QUAD Core Processing. 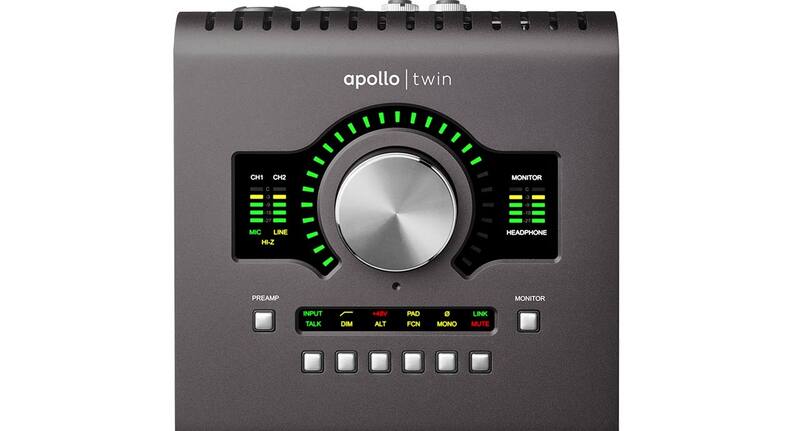 Apollo Twin MkII is a ground-up redesign of the world’s most popular professional desktop recording interface for Mac and Windows — delivering enhanced audio conversion with the tone, feel, and flow of analog recording. Built upon UA’s 60-year heritage of audio craftsmanship, Apollo Twin MkII starts with two Unison™-enabled mic preamps and stellar next-generation A/D and D/A conversion derived from UA’s flagship Apollo 8, 8p, and 16. Together with its included bundle of UAD analog emulation plug-ins — which you can track through in real time with UAD-2 SOLO, DUO or QUAD Core processing — Apollo Twin MkII is born to make records. 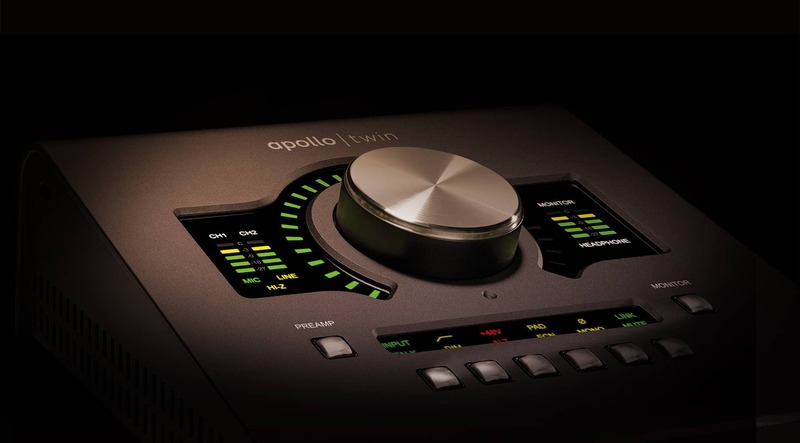 Apollo Twin MkII features two Unison-enabled mic preamps, letting you track through exacting mic preamp emulations from Neve, SSL, API, Manley, and Universal Audio. An Apollo exclusive, Unison technology nails the tone of these sought-after tube and solid state mic pres — including their input impedance, gain stage “sweet spots,” and the component-level circuit behaviors of the original hardware. Right out of the box, Apollo Twin MkII provides a suite of incredible analog emulation plug-ins including the world’s only authentic Teletronix LA-2A, 1176LN, Pultec EQs, and the Unison-enabled UA 610-B Tube Preamp. Developed by UA’s world-renowned team of algorithm engineers, these Realtime Analog Classics plug-ins set the standard by which all other hardware emulation plug-ins are judged. From the tube warmth of the Pultec EQ on guitars, to the gentle limiting of the LA-2A on vocals, your recordings will take a giant leap forward in rich, sonically complex analog sound. Beyond the included Realtime Analog Classics plug-ins, Apollo Twin MkII lets you tap into the full library award-winning UAD Powered Plug-Ins — including vintage EQs, Compressors, Reverbs, Tape Machines and more — at near-zero latency, regardless of your audio software’s buffer size and without taxing your computer’s CPU. With exclusive emulations from Neve, Studer, Manley, API, Ampex, Lexicon, Fender, and more,* it’s like having an endless analog studio, right on your desktop. And unlike competing interfaces, these DSP-powered plug-ins are also available in your DAW for mixing. Of course, the heart of any audio interface is the quality of its conversion. Apollo Twin MkII improves upon the original Apollo Twin’s gold-standard audio quality with completely redesigned A/D and D/A conversion — giving you increased dynamic range and ultra-low THD. This next-generation conversion results in breathtaking clarity, depth, and accuracy in your recordings. The new Apollo Twin MkII offers greatly improved monitor functionality versus the original — with Mute, DIM, Mono, and ALT speaker switching. It also includes dedicated monitor remote controls and a built-in Talkback mic for easy communication with talent and/or recording slate cues. These features, combined with Apollo Twin MkII's scalability, make it the new standard for professional desktop recording. Thanks to Apollo Expanded software, users of any Thunderbolt-equipped Apollo Twin, Apollo 8, Apollo 8p, and Apollo 16 audio interfaces can combine up to four Apollos and six total UAD-2 devices — adding I/O and DSP as your studio grows. Apollo Twin MkII makes the perfect intelligent desktop controller for a full Apollo system. Apollo Twin MkII also includes Unison technology on its front panel instrument input, giving you access to dead-on emulations of guitar and bass amps like the Fender '55 Tweed Deluxe, Marshall Plexi Super Lead 1959, and the Ampeg B-15N Bass Amplifier. With Apollo Twin MkII's Console 2.0 application — a complete re-imagining of Apollo’s original Console software — you can take advantage of over 25 user-requested features such as Channel Strip presets, Drag & Drop functionality, dynamically resizable windows, and more. Learn to use Apollo Twin as producer/engineer Fab Dupont (Jennifer Lopez, Mark Ronson) demonstrates basic setup, routing, and recording with UAD plug‑ins. Top audio interface and plug in platform! With the Realtime Analog Classics plug-in bundle, you get legendary compressors like the Teletronix® LA-2A and EQs like the Pultec® EQP-1A, stunning guitar and bass amp emulations from Softube, as well as UA’s landmark 610-B Tube Preamp and EQ plug-in. Includes the "Realtime Analog Classics" UAD plug-in bundle. Other UAD plug-ins sold separately. I gained a great interface and new monitors,wow huge difference between my last interface,warm, depth and the stereo image is much clear in my ears,amazing interface,i will not look for another interface no more i alheady got the right one!! Upon purchasing my UAD Apollo Twin MkII Duo, I was able to instantly notice a difference in the vocals being presented to me. The included plugins are amazing as well! I really like the Pultec EQ's and the 1176LN. I have been recording on UAD Apollo Twin Duo since they were released to the public. Then I updated to the Apollo MK II about six months ago. All I have to say is once you get used to recording & mixing with the Apollo it makes your overall project comes to life. I use UA more than 15 years and they always deliver. I upgraded my Twin Solo with Quadra MKII and I must say that for the money I expected more plug in power because new plug ins require more. THIS IS excellent interface with stunning plug ins and I highly recommend it for song writing and recording. Killing Interface - Five Stars - nothing more to say! Ci ho pensato a lungo, ho valutato diverse opzioni e alla fine mi sono deciso ad acquistarla. Ora che ci lavoro da qualche settimana, mi rendo conto di aver buttato un sacco di tempo in valutazioni e video comparativi... questo strumento è assolutamente fantastico. Qualità elevatissima. Per non parlare poi del servizio clienti: molto disponibili e attenti. Ho acquistato l'interfaccia due settimane prima di una promozione molto interessante e senza che gli chiedessi niente, mi hanno fatto trovare 4 bei plugins nel mio account anche se non ne avrei avuto diritto! Super soddisfatto! This is a great device for both home Studio and field recordings! I like everything! Buy - you will not regret! Coupled with Universal Audio plug-ins, this is the most versatile piece of portable studio kit you can own. Love this device, because I can take high quality recording and mixing with me everywhere with no big hassle. Whether you play an instrument or sing, this device combined with any UA Plugin will improve you as a Human Being! very cosmic thing. awesome. thanks. An amazing intro to UA! Best sound quality and best product you could get. This product is amazing!